Martial Arts on the Move offers quality, convenient, affordable Martial Arts lessons that travel to you! Our instructors work with teachers and parents to redirect a child’s high energy behaviors through using positive rewards and recognition. We offers a curriculum with a variety of styles including Tae Kwon Do, Brazilian Jiu Jitsu, Boxing, Escrima, and Muay Thai through a system that is exciting, dynamic, educational and empowering. INTUITION is a Safety School designed to teach children to protect themselves, when we aren’t there to protect them. INTUITION teaches our children to listen to their “super power” (AKA: Intuition) to keep them SAFE! 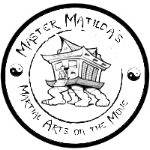 Master Matilda's Martial Arts on the Move is a book series depicted by Master Matilda and her Traveling Dojo created with a passion to share Martial Arts with children all over the world. Each book in the series has a valuable life lesson and an associated class plan that teaches Martial Arts! We believe 110% in family values and creating a strong, unified family unit. Students at WCMAM are part of a family, and unite as a team to make a positive difference in our community and in our world. To create a positive and accepting “home away from home”, a Martial Arts Learning Center, where our WCMAM Family learn and practice much more than just Martial Arts and unite as a team respecting and supporting one another and strengthening our community. To partner with parents and schools in guiding our students to live and abide by the WCMAM Student Oath, leading by example, and honoring the commitment of being a Martial Artist in uniform and out. To build character and confidence by providing individual attention and recognizing each and every students’ needs in order to build on one’s strengths and improve on one’s weaknesses and ultimately achieve our goals. Join our Martial Arts Family and commit to training that will develop you as an individual physically, mentally, spiritually and with good character! Please see Studio office to complete HONOR AGREEMENT and receive private, student passwords! Find out what is happening at West Coast Martial Arts! We are excited to meet you and to learn about your needs. Please contact us today to schedule your first class!